Since I moved to Kristinehamn last summer I have been traveling mostly by train to my work in Karlstad. This has given me a lot of opportunities to practice the noble art of “armpit turfing”. What is “armpit turfing”? Some may ask. Basically it is all about tricking the mobile to think it is still inside the zone by blocking the gps-signal. My tactic is to quickly place the mobile in my armpit and squeeze until Jossan tells me that the zone is taken. I have also heard that others are blocking the signal by pressing the phone between their thighs, sitting on the phone or placing the phone beneath the table. I haven’t tried these other techniques myself so can’t tell what works best, try for yourself. 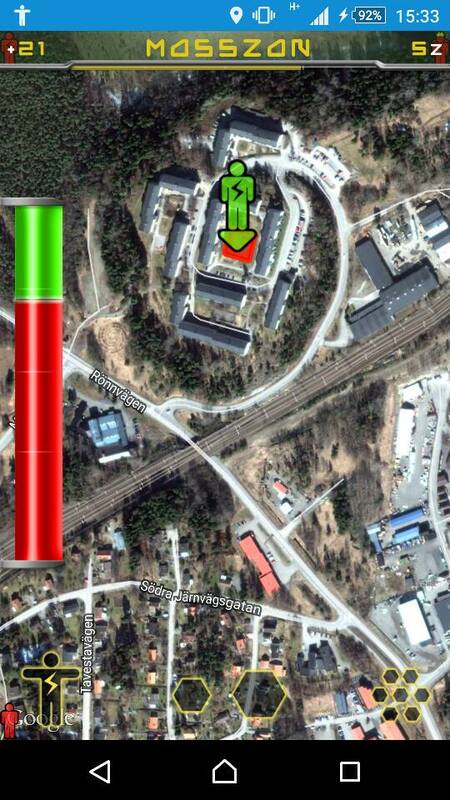 My trip from Kristinehamns train station to Karlstads consist of 10 zones that I have been able to take so far. Fieldislet, VarnumFågel, ÖstervikView, Wilhelmsbron, Alstertunnel, DoNotCross, VälsvikenStn, Tågbrozon, ÖstraKilen, and InBetween. Some are of course easier than others, the ones placed where the trail goes straight are easy if you just have the timing but the ones placed over the rail next to a turn requires some luck because the turfman doesn’t always stay on the track. There are some additional zones near the track which I have been closed to take some times but haven’t succeeded yet like BodyZone or VäseNorra but shame on the one who gives up! VälsvikenStn was the first one to become purple but I had it colored in orange before moving so it doesn’t really count. Next is ÖstraKilen which was yellow before I moved, I have 7 takes to go for the purple color. When I visited Stockholm this summer for the AC/DC concert I took MossZone in Järna which is far from the track, that one I was really satisfied with. Besides the normal station zones on the way to Stockholm in Degerfors, Hallsberg, Katrineholm and Södertälje was I also able to grab the zone LonelyBridge when the train was traveling in over 200 km/h. Then I really felt that the training gave result! 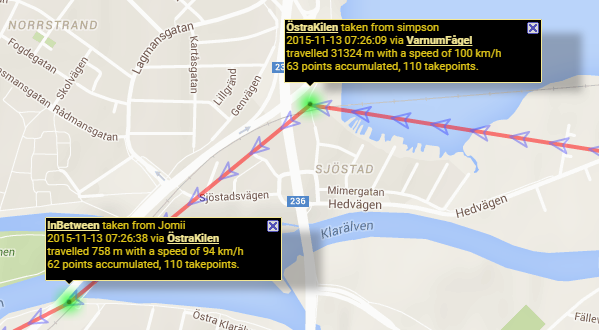 In November I was able to grab both ÖstraKilen and InBetween on my daily trip to work. That felt really nice since you only have a few seconds between receiving the take on the first zone until you are inside the next one. The speed recorded by the server between these zones was above 100 km/h and I could find myself on Pobes list of possible cheaters: http://www.hoddmimes.com:8080/turf/TurfIrregularities. I took that as a compliment. But I’m not a Jedi yet!